Pot Pie, it’s what’s for dinner! Am I the only one that grew up eating frozen, $1 chicken pot pies?? We usually had a stash of them in our freezer for a quick meal. My mom worked full-time out of the house, so she didn’t have time to make many things homemade. The price was also right so this was sometimes our go-to meal. We also had plenty of great food in the freezer like fresh veggies and lots of fish and deer, but a couple of times a month, it was Pot Pie night. Even though the label reads no trans fats, that is a lie. If a prepared food contains less than .5 grams, they don’t have to label it but when it comes to trans fat, even small amounts are VERY harmful to our body! When I look at the ingredients in the pot pie and all of the BAD carbs, it’s no wonder I weighted 155 lbs in the 5th grade!! Wow! Frozen meals are the worst… lots of fake ingredients, preservatives and typically poor food quality! About My Chicken Pot Pie recipe. Honestly, I have never had a homemade pot pie that didn’t consist of Bisquick over some chicken and canned cream of mushroom gravy. 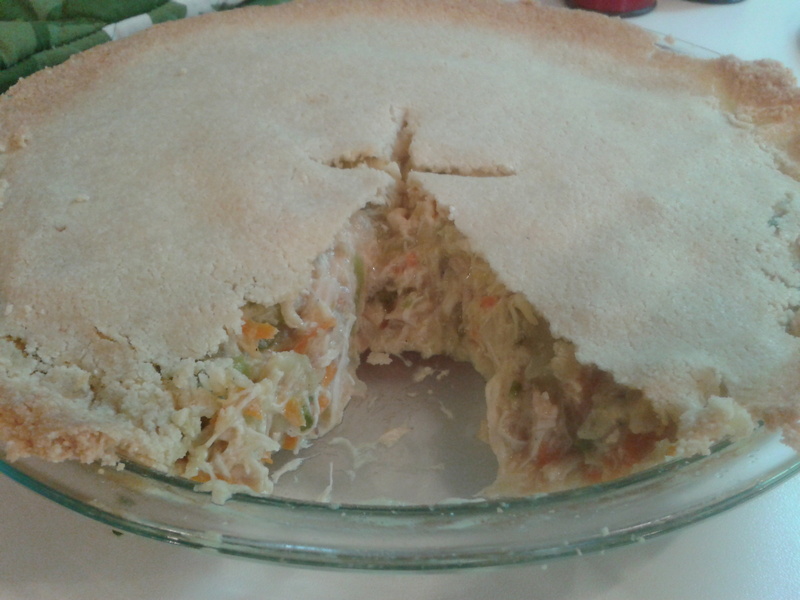 This Chicken Pot pie FAR exceeded my expectations! It not only looks but taste so GOOD! I can’t wait to make a Turkey Pot Pie with leftovers from Thanksgiving! Feel free to make the filling ahead of time. That’s what I did when making the large pot pie. Instead of using wheat flour or cornstarch to thicken the gravy, I use Arrowroot powder. Arrowroot is an excellent non-grain thickener but must be added at the end of a recipe or it will turn a gelatinous texture if overexposed to heat. 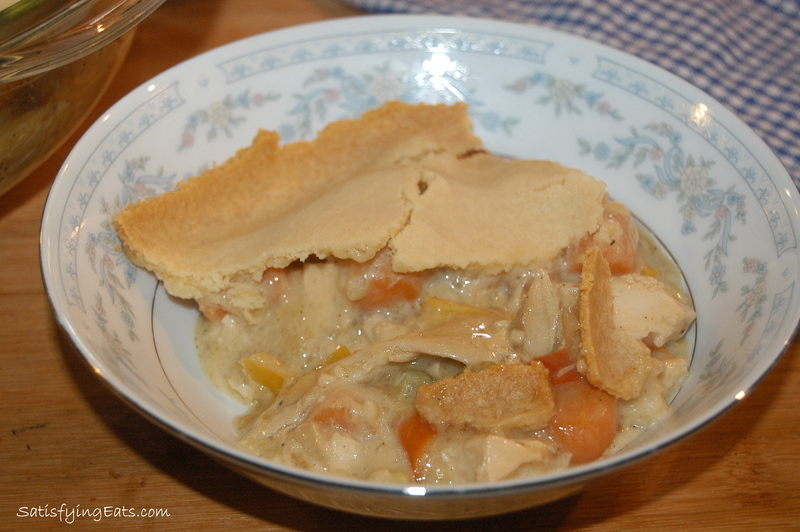 Use leftover meat in your Pot Pie. The first one I made I cut up raw chicken breast but for the second one, I used the meat from one roasted chicken. I then used the carcase to make my homemade chicken stock. The key to a good gravy is GREAT chicken stock. Do NOT buy it, make it! Use leftover veggies from the fridge. 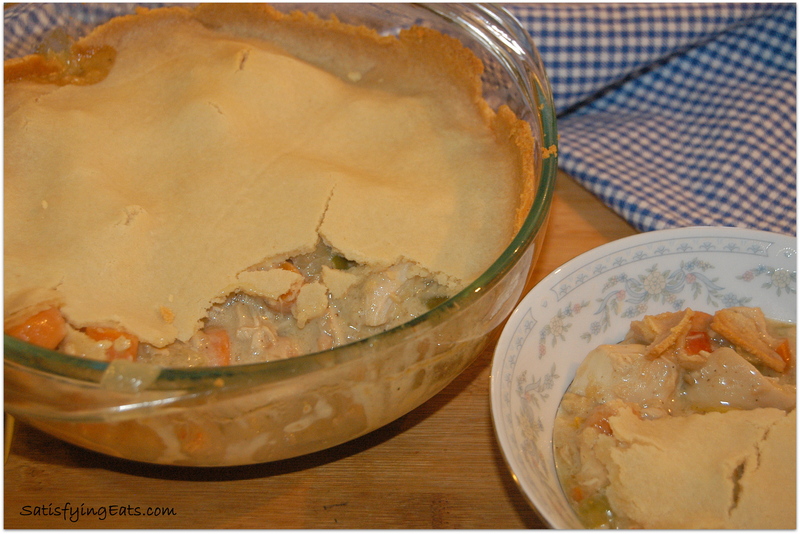 Carrots, cauliflower, broccoli, squash, zucchini and diced sweet potato would be great in this pot pie. Measure the dry ingredients ahead of time and store in the fridge. Then all you will have to do is add butter and egg white. Save the egg yolk to make a Crème brûlée or ice cream. Make single serving pies using 8 oz ramekins or for a large, family size Pot Pie, use a 2 quart baking dish. There is enough dough to make 4, 4 inch round crusts or an 8.8-9 inch round crust. Feel free to use a square or rectangular cooking vessel but you may need to double your crust. If making 4 small pies, I cut out 2 crust and then re-rolled out the remaining dough for the last 2 crusts. If making small pot pies, you may have filling left over. This crust is very delicate so handle with care. My trick to making sure the crust didn’t break was to invert the crust along with the parchment paper on top of the filled ramekins or baking dish. Then just pull away parchment paper. Don’t worry if the crust “cracks” over the pie. The more I have worked with crust, the better I get at not tearing them. Practice makes perfect! DAIRY-FREE Option: Use 1/4 cup coconut milk in place of the heavy cream in the filling and use expeller pressed coconut oil or palm shortening in the crust. I normally don’t use canned coconut milk but using the canned would give the gravy a little extra richness. To prevent crust from falling apart, once excess crust has been removed, cut parchment paper so that you can pick up crust and paper with your hand. *Nutritional Value is based on recipe using chicken breast and 4 tablespoons of arrowroot powder. In a large frying pan over medium heat, melt butter then add onion and peppers. (If using raw carrots, add at this time.) Saute for about 10 minutes or until veggies are tender. Add garlic and cook for another 2 minutes. (If using raw chicken, add to pan now.) Cook for 3 minutes and flip and cook for another 3 minutes or until chicken is done. Reduce heat to medium-low and add 1.5 cups of the chicken broth and all of cream. (If using pre-cooked chicken and carrots, add at this time.) Add cayenne, salt and pepper. Allow to simmer for 5 minutes on low. While simmering, make a slurry for the arrowroot powder. Add the 1/2 cup of reserved chicken stock along with 4 tbsp of arrowroot powder to a small bowl. Whisk until powder is dissolved and there are no clumps. Add arrowroot powder slurry to veggie and meat mixture while whisking. Taste for seasonings and adjust if needed. Cook for 1-2 minutes and then turn off heat. Preheat oven to 375 degrees F. In medium bowl, blend dry ingredients. Then add butter and egg white and blend with wooden spoon until dough forms. Taste for saltiness and adjust if needed. Form dough into ball and set aside. For the large Pot Pie: To ensure your dough is the correct size, on parchment or wax paper, turn dish upside down and trace its shape with a pen or pencil. I used a 2 quart, 8.5 inch diameter Pyrex dish. Place the prepared dough in the center of marked paper. Place another sheet of parchment on top of the dough and roll out until it is the size of the marked parchment. Make sure dough is even thickness. Pour prepared meat and veggy mixture into dish. Pick up prepared crust (still on parchment paper) and carefully invert onto meat and veggie mixture. CAREFULLY pull away paper. Trim away any extra crust around the edges. For mini Pot Pies: Use the 8 oz ramekins to press into dough and twist to cut out circle of crust. Use a fork to make indentions around the edge of the crust. Don’t press to hard or dough will break. Fill ramekins with 1 cup of meat and veggy mixture, being sure to include gravy. To insure crust does not break, remove excess dough and cut the parchment paper so that you can pick up the dough and paper to transfer the dough directly to the ramekin. Invert dough over meat filled ramekin and pull away paper. 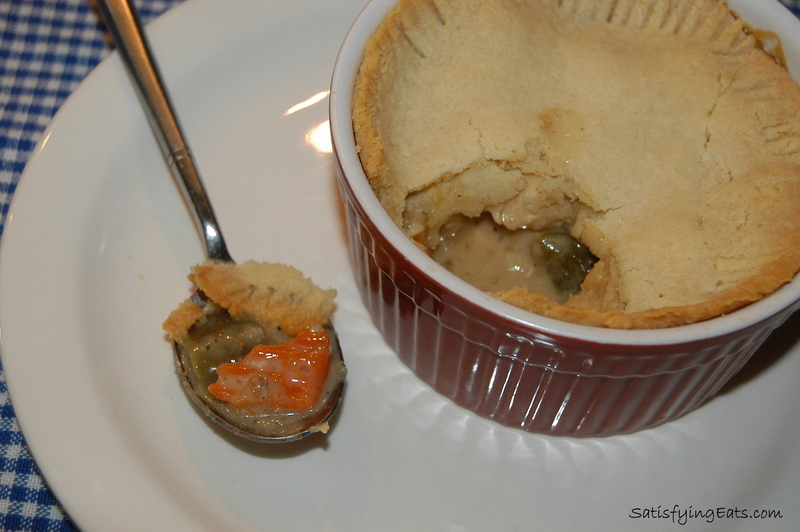 Bake small ramekins for 20-25 or the large pot pie for 35-40 minutes or until edges of crust are slightly brown. « Happy Birthday to ME!!!! 99¢ eBook & $16.99 Spiral Cookbook! 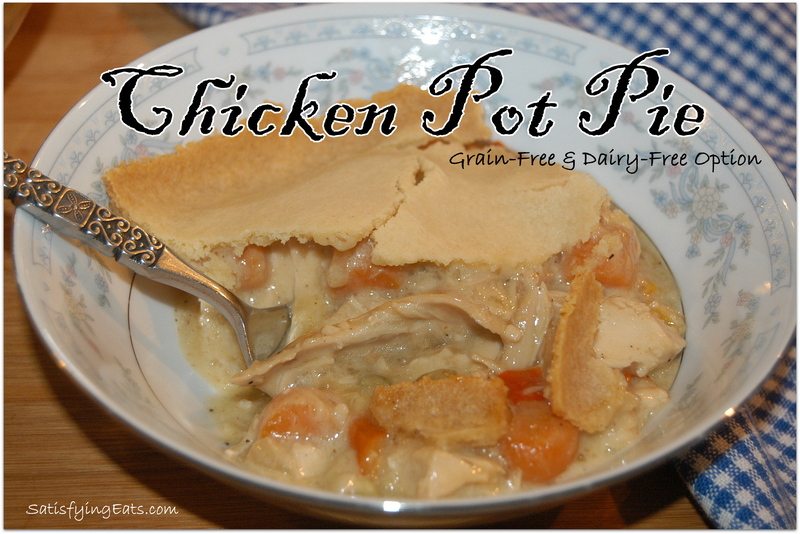 I’ve never gone wrong with your recipes and am looking forward to this pot pie! Hope you never get tired of trying new things. I hope you enjoy it Joann! I drink my chicken stock as soup and I would NEVER do that with the stuff in the can! Looks like you have smart kids as well! 😉 I am looking forward to hearing back from you after you have made it! This will be one of the first recipes I try this autumn. Have you tried freezing one of these? As a single person, I could never eat 4 pot pies, but I am always eager to make ahead and freeze. Would you think it best to do before you bake it? Or pre-bake say, half way and then freeze? Lori, I haven’t frozen any yet. I could see either way working but I would probably not pre-bake but thaw completly before cooking. Let me know how it works out! What can you use instead of egg white? Steve, I haven’t tried subbing anything for the egg white. I use it as a binder. Please let me know if anything else works! Oh my! That looks delicious! I will have to put it on my menu rotation in the Fall…I’m sure my kids will love it! This is truly as delicious as it looks! I found this blog yesterday and went out and bought all ingredients to make this today(except no time to make the chicken stock as I was too impatient to wait until tomorrow to make the pot pie)! I used Whole Foods organic chicken stock in the meantime. I made this for dinner tonight and it was quick and easy! I added broccoli per your recommendation and it was great! It was sooooo good that there is NONE left over. My husband ate 4 helpings, and I barely got 1! My 5 y.o. asked if I could make it all the time! THANK YOU! I will be purchasing your cookbook! Your recipe looks really great, but I am SO not happy with printing it. It printed 18 pages — all the comments etc.! Please do something about that — that’s not very green! Only the recipe should print. Wendy, because this is a FREE blog, I don’t have the fancy “Print recipe” buttons. To print the recipe only, simply highlight the recipe, right click and print. Hi. I love your blog and am wondering if you have tried to do a dumpling yet. I tried to make some with a combination of bean and oat flour, but the consistency wasn’t too great, and I sure could use some suggestions. Thank you! I haven’t tried the arrowroot powder yet but I was wondering if you ever use glucomanan powder. I’ve been reading different blogs about using it as a thickener and also making pudding with it. I haven’t tried that yet either. Love your site and I ordered your new book. Just wondering if you could give me any pointers on the glucomanan powder. where do you purchase heavy whipping cream without careenga (spelled that wrong) I have looked at all our organic grocery stores and they all have that in it- also where do you get xylitol?? Shelia, it can be hard to find. I get it from our local farmer’s market. You can purchase xylitol at health food stores or online. This was so yummy! I felt like I was eating the real thing! That’s great to hear Smantha! Hello Melissa! I just made this recipe and it’s AWESOME. I slightly changed the proportions to make it more like my childhood pot pie, and I used xantham gum instead of arrowroot. I used coconut milk and hesitated because I was afraid of the “coconutty” flavor but it doesn’t taste coconutty at all. I also rolled the dough between two silicon mats and it worked like a charm. Here’s my pot pie! And THANK YOU for this recipe. PS. By the way I tried the banana bread again and it was (again) a disaster, the bitter taste was terrible 🙁 I’m sure the recipe is great though and that this is a food chemistry problem with one of my ingredients. PS 2. Ever thought of an avocados-cocoa dairy-free frosting recipe? There are tons of them out there but I’d like to see your low-carb version :). Hi Melissa! This chicken pot pie was absolutely amazing!!! I’m new to grain free cooking and I’m so excited to have found your website. I am looking forward to trying more of your recipes as I begin my journey on a healthier lifestyle to loose weight. Made this tonight for dinner (from the cookbook) and I love it! I really wish my family would get on board though – no matter what I make and how good it tastes I get less than stellar responses from the hubby – oh well, I’ll keep trying! 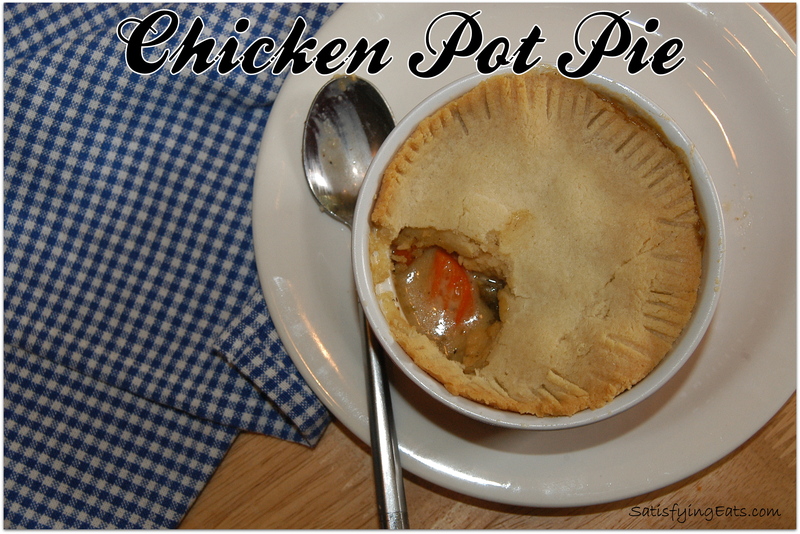 We love this pot pie! I generally use carrots, peas, and celery with the onion and garlic and instead of the cream or arrowroot powder we use cauliflower cheese sauce from another paleo site. It gives it the thick creamy savory texture and flavor with another added veggie! Thank you so much for this! Today I am making it for another grain free mama who just had a baby! She is super excited!